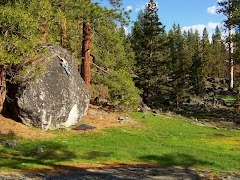 When I woke up Saturday morning in South Lake Tahoe, I didn't think bouldering was going to be a possibility. The entire town was engulfed in a thick, wet fog. But I thought, what the hell! So David Outcalt and I spent the weekend at Prisoner Hill. Both days that I drove down I passed through the inversion coming down Spooner. It was foggy at the top, foggy at the bottom, and sunny as hell in the middle. It was a neat moment passing through there each morning. When we arrived the whole area was in a very thick fog. There was a spooky vibe with the mist. The boulders just appeared out of it throughout the entire trecherous hike. The first day we climbed on the north side and did all the moderate classics with Jason Hogan joining us. We did Reno 911 v0 , Cocaine Blues v3, Congical Visit v3, and 15 Minutes to Go v5. Then we hiked all the way over to the south side of the big hill over to the Watchtower Boulder, home to Noah Kaufman's awesome power-fest Alcatraz v10. I worked on repeating the sit-start and David worked the gem. At first we were both flailing pretty hard, but then we got psyched and they both went down. David Outcalt caught the likely 6th ascent of Alcatraz v10, a proud moment for this was his first of the grade. I managed to unluck the beta that made the sit-start doable and sent just after David. The second Day we spent the morning warming up on top of the south side. In this spot the rock is mostly crappy at the top and good at the bottom. So we spent a little time riding the choss wave. But the gripped factor did us well as we warmed up. Next , we went over to Alcatraz to do some filming then went straight over to a possible project wall that was killer. Sitting only about 50 yards from the Watchtower this awesome face had two plum lines on each side. It looked like they've never been done but you never know around here. David caught the likely FA of the right line which he dubbed What Are You In Here For? v6ish. I did this line just afterwards and it was killer. Next I got the left line and it was about v7. But then David broke a hold in the middle that may have made this climb slightly easier. He pretty much ran laps on the crux to the heady top out. But it was at the end of a long weekend and we both ran out of juice for any more lines. But it was a great time and we look forward to going back next weekend if the weather is good...or if it's fog. We made a short 5 min. video of some of the coolest lines. I hope you enjoy the video. Prisoners in the Fog from Jesse Bonin on Vimeo.